World policy chiefs, United Nations experts and human rights organisations have united to condemn the planned execution of five Ahwazi Arab prisoners of conscience. The latest to weigh into the tide of censure is EU foreign policy chief Dame Catherine Ashton who voiced "great concern" over the death sentences against the five men from Khalafieh, who were arrested in early 2011 for participating in an Arab cultural organisation. She urged the Iranian regime to commute the sentences, which were recently upheld by the Supreme Court, against Mohammad Ali Amouri, Sayed Jaber Alboshokeh, Sayed Mokhtar Alboshokeh, Hashem Shaabani and Hadi Rashedi. She added: "I am concerned by reports that these men did not receive fair trials, and were forced to confess. I would like to remind the Iranian authorities of their obligations under international law, in particular regarding the protection of the civil and political rights of members of ethnic minorities." Her statement came shortly after the human rights commissioner of the German foreign ministry, Markus Löning, criticised the lack of transparency in the trials and stated that the Supreme Court had "run contrary to the principles of the rule of law" in upholding the death sentences. He added that "it is completely unacceptable and displays a disregard for human dignity" for Iran to break international law and its own constitution by condemning to death people who were only "advocating for cultural rights and political participation." The United Nations Human Rights Council has also weighed in with strong criticism of the conviction and sentencing of the five men last July. Earlier this week the United Nations independent experts on Iran, peaceful assembly and of association, extrajudicial executions, torture and minorities urged the Iranian authorities to halt the executions. In a statement, the Special Rapporteur on torture, Juan E. Méndez said: "Of grave concern, are allegations that the five individuals were subjected to torture and other ill-treatment in detention and were forced to sign confessions. 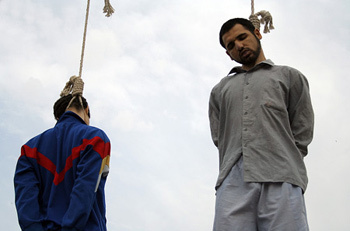 This is not only in breach of Iran's international obligations under the international covenant, which imposes an outright prohibition on torture, it is also in breach of Iran's Constitution that explicitly forbids the use of all forms of torture for the purpose of extracting confessions or acquiring information." UN Special Rapporteur on Iran Ahmed Shaheed drew attention to the attack on the men's freedom of speech, saying: "It is absolutely unacceptable for individuals to be imprisoned and condemned to death for exercising their rights to freedom of peaceful assembly, association, opinion and expression, and affiliation to minority groups and to cultural institutions." Shaheed was joined by UN Special Rapporteur on minority issues Rita Izsák who voiced her concern over the sentencing of individuals for advocating minority rights. International, Iranian and Ahwazi Arab human rights organisations have also expressed their alarm at the imminent executions. The International Federation for Human Rights (FIDH) was among the first international NGOs to react to the Supreme Court's decision to uphold the death sentences. In a statement, FIDH vice president Karim Lahidji, also president of the Iranian League for the Defence of Human Rights (LDDHI), said: "The ethnic communities, and in particular the Iranian Arabs, Kurds and Baluchis, are regularly targeted for demanding their rights, and occasionally members of these communities and their family members fall victim to the vengeance of authorities... The Iranian government must immediately revoke the death sentences of activists from ethnic communities as well as all prisoners of conscience and join the accelerating worldwide trend to abolish the death penalty." In a joint statement, Amnesty International and Human Rights Watch called for the death sentences to be annulled. Nobel Prize laureate Shirin Ebadi also jointly signed a joint statement with a number of Iranian NGOs calling for a review of the cases "in accordance with due process standards." They said: "Among ethnic minorities in Iran, Ahwazi Arabs are subjected to some of the most severe repression from the central government."